As the birthplace of one of India’s most beloved heroes, Ayodhya is to Rama devotees what Bethlehem is to Christians. I have been visiting India for more than 30 years and probably 30 times in all. India is in my system and I have an abstract, but deep connection with Hinduism, which was confirmed in a private ritual by Guru Brahmashree Anjam Madhavan Namboodiripad in Guruvayur Temple long ago. As we say in England “you can take Antonia out of India, but you can’t take India out of Antonia”. 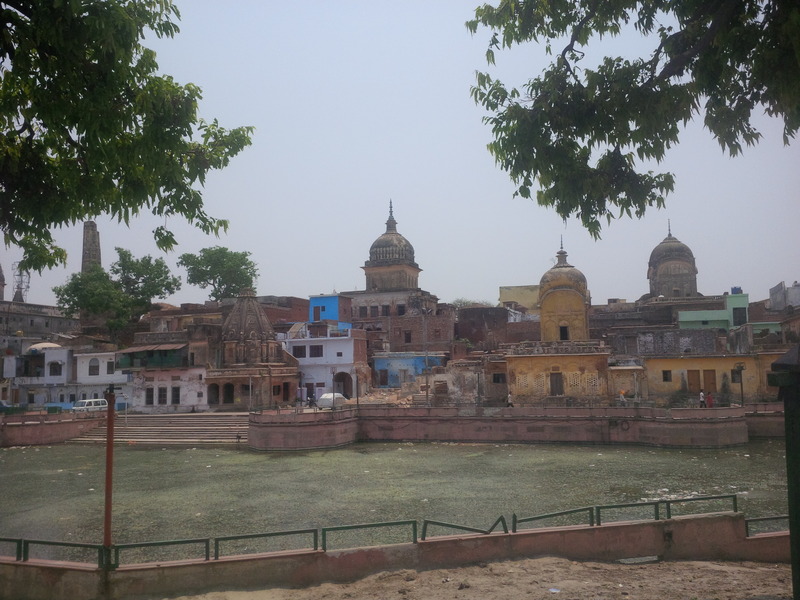 Seeking a starting point for my Ram Karya–this documentary project called ‘The Perfect Man’ about Rama and Sita’s love story and the great history of Rama’s ascendance from mortal to God– I visited the city of Ayodhya, where every house is a Temple. To my knowledge, there is no other city in the world, where around 3000 houses are simultaneously Temples. As the birthplace of one of India’s most beloved heroes, Ayodhya is to Rama devotees what Bethlehem is to Christians. In 2012, I made an amateur biographical documentary about the late Shri Uthradom Tirunal, HH Marthanda Varma V Padnamabha Dasa of Shri Padmanabhaswamy Temple in Thiruvananthapuram.Over the weeks of filming, this lively royal gentleman shared many intimate memories and reflections and he invited me to join specific festivals in the Padmanabhaswamy calendar, including Ulsavam/Navarathri, Pallivetta, and Araat and he introduced me to CVN Kalari Sangham (the most graceful martial athleticism in the world) under the direction of Gurukal Sathyanarayanan. His health and stamina were failing, but his courtesy and thoughtfulness for me never failed. As we chatted, I used to massage his old sore feet and we developed an understanding and trust. I cried for months when he died and my sweet husband made me a collage of photographs of the man who had shared so much and devoted his life to serving his Lord. This whole experienced left me with a desire for a new tale to tell. His Highness had been working on a new edition of the Bhagavad Gita with Gautham Padmanabhan (soon to be published by DC Books, Kottayam) and I decided to read Ramesh Menon’s poetic retelling of the Ramayana and Arrow of the Blue-Skinned God by Jonah Blank plus other books. This inspired me beyond measure and I knew that I had to follow Rama’s footsteps from Ayodhya to Sri Lanka and back. So, last week, I finally landed in Ayodhya to take motivation to finally begin my work. My arrangements made from London turned out to be blessed. I had sent a schedule and had asked for an informed guide. In Lucknow, I got a Ramayana encyclopaedia in the form of Ravi Naimish, who prefixed our visit saying that every sentence in the Ramayana had a backstory. Because of logistics, we started at the Shri Guptar Ghat in Faizabad, where Rama left the earthly world via the Saryu River. ‘Holy Cow’ has a completely new meaning here- beautiful cows wander freely in and out of the Chakraharji Temple and snack along the river front. A pale cow was curious about me, probably due to my fondness of cows so I stroked it. This ancient Temple decorated with royal fish emblems was my first introduction to a “live in Temple” and a living Temple. A whole family lives and breathes here, beds were tidily rolled up and breakfast was cooking. In my very English way, I felt we were intruding on their early morning rituals, but they were apparently undisturbed. On the way out, the pale cow was waiting, I let it enjoy some flour and stroked some more, including the tail and hoof, receiving in return an assurance that I would end up in heaven. As we left, I wondered, whether other places in Ayodhya would have the same serenity as of this place. Then, we backtracked to the birthplace of Rama, at Ramkot/ Svargadvara. After being thoroughly searched at least 5 times, security here is diligent but hesitant to properly pat down a ‘white woman’, the crowd stuttered through what seemed like kilometres of caged walkway to where the Idol lives under a tent, it was only a glimpse as everyone was cramming to pay their respects. We were given raisins and sugar-ball prasad to feed the descendants of Hanuman’s army that clamber all over the cage. At Treta ke Thakur Temple, painted to match the sky, but seemingly neglected for such an ancient and significant site, we intruded into another family home. The guardians of the original Idols of Rama, Sita, Lakshman and Bharat only open their treasure to devotees once a year for security and conservation reasons. I made a prayer for someone to come and do some restoration here. Quite the opposite was necessary at Hanuman Garhi, where devotees had turned up to wash and polish the picture tiles and floors of the Temple. Volunteers with their hose and squeezy mops and brooms were smiling whilst sprucing up the exterior to a shine, if only all Temples in India were as conscientiously cared for. I was heavily garlanded and felt surely my mission will be accomplished, but better was yet to come. Sanjay Das, who manages the administrative affairs of the temple, received me for an interpreted chat. I explained my project and he was delighted that Ayodhya might get better known on the international map. I apologised that I was going to avoid politics and he said politics were not necessary to tell Rama’s story, to quote him “The Almighty made mortals, we divided ourselves”, what a quietly impressive man. I commented to Ravi how young this Priest was, his reply “it is not age, but knowledge and talent that makes a Priest” left me with food for thought. At Kanaka Bhavan, Sita’s kitchen, the drum was rolling, the crowd was seated in front of three pairs of Sita-Rama idols. Varying in size like the Russian dolls, the smallest pair was brought towards us for adoration and give blessings in return. It is very moving to watch how alive Hindu religious tradition remains, so symbolic of the true independence of India. By now we were hungry and hot, the hospitable Mr Triloki Nath Pandey at Kar Sevak Puram offered us lunch and shelter. All the male students were lunching alongside us and I remarked there were no women, our host answered “their (the male students) life is not a piece of cake”; just then the girl students, who study social work here, came out from another residence to wash their tin plates in their lilac and crimson sari uniforms. After our lunch, we moved on to Nageshwar Nath Temple, where Ganesha was being bathed, meals were being served below, and I took a beautiful photograph of a cow gazing into the temple. Finally, in spite of my flu, wobbly knee and the 44 degree temperature we climbed up a crumbling Mani Parbat, I opened the little shrine to say to Hanuman we had made it, we stumbled further up onto the collapsing roof top to admire the view. The shrine looked cared for, but the approach up the Parbat was disheveled and I imagine difficult for pilgrims. Personally, I can hack the challenges that India presents, but it is baffling to the average Westerner how such a Holy city can be in such a state of disrepair, a disappointingly old fashioned museum, one budget Dharamshala, a scarcity of toilets and rubbish broadband may just be acceptable to the faithful Diaspora pilgrims, but it does not satisfy the C21st international tourist. The birthplace of Lord Rama, who lives as passionately in the hearts of his worldwide devotees much as he did 5000 odd years ago, deserves better. Edit: In the original article it was incorrectly stated that Sanjay Das was President of Akhara Parishad. The Author has clarified that Sanjay Das actually takes care of administration of Hanuman Garhi Temple and many consider him to be a close associate of Guru Gyan Das, who was previously President of Akhara Parishad. Antonia Filmer is former British Vogue Fashion Editor, Home Furnishing Design Director of Laura Ashley Ltd., producer of Garden Operas for 10 years to benefit a children’s charity. Antonia is an inveterate traveller and is currently the London correspondent for The Sunday Guardian- India.